Machine learning (ML) is the scientific study of algorithms and statistical models that computer systems use to effectively perform a specific task without using explicit instructions, relying on patterns and inference instead. It is seen as a subset of artificial intelligence. Machine learning algorithms build a mathematical model based on sample data, known as "training data", in order to make predictions or decisions without being explicitly programmed to perform the task. :2 Machine learning algorithms are used in a wide variety of applications, such as email filtering, and computer vision, where it is infeasible to develop an algorithm of specific instructions for performing the task. Machine learning is closely related to computational statistics, which focuses on making predictions using computers. The study of mathematical optimization delivers methods, theory and application domains to the field of machine learning. Data mining is a field of study within machine learning, and focuses on exploratory data analysis through unsupervised learning. In its application across business problems, machine learning is also referred to as predictive analytics. The name machine learning was coined in 1959 by Arthur Samuel. Tom M. Mitchell provided a widely quoted, more formal definition of the algorithms studied in the machine learning field: "A computer program is said to learn from experience E with respect to some class of tasks T and performance measure P if its performance at tasks in T, as measured by P, improves with experience E." This definition of the tasks in which machine learning is concerned offers a fundamentally operational definition rather than defining the field in cognitive terms. This follows Alan Turing's proposal in his paper "Computing Machinery and Intelligence", in which the question "Can machines think?" is replaced with the question "Can machines do what we (as thinking entities) can do?". In Turing's proposal the various characteristics that could be possessed by a thinking machine and the various implications in constructing one are exposed. Machine learning tasks are classified into several broad categories. In supervised learning, the algorithm builds a mathematical model from a set of data that contains both the inputs and the desired outputs. For example, if the task were determining whether an image contained a certain object, the training data for a supervised learning algorithm would include images with and without that object (the input), and each image would have a label (the output) designating whether it contained the object. In special cases, the input may be only partially available, or restricted to special feedback. [clarification needed] Semi-supervised learning algorithms develop mathematical models from incomplete training data, where a portion of the sample input doesn't have labels. Classification algorithms and regression algorithms are types of supervised learning. Classification algorithms are used when the outputs are restricted to a limited set of values. For a classification algorithm that filters emails, the input would be an incoming email, and the output would be the name of the folder in which to file the email. For an algorithm that identifies spam emails, the output would be the prediction of either "spam" or "not spam", represented by the Boolean values true and false. Regression algorithms are named for their continuous outputs, meaning they may have any value within a range. Examples of a continuous value are the temperature, length, or price of an object. In unsupervised learning, the algorithm builds a mathematical model from a set of data which contains only inputs and no desired output labels. Unsupervised learning algorithms are used to find structure in the data, like grouping or clustering of data points. Unsupervised learning can discover patterns in the data, and can group the inputs into categories, as in feature learning. Dimensionality reduction is the process of reducing the number of "features", or inputs, in a set of data. In addition to performance bounds, learning theorists study the time complexity and feasibility of learning. In computational learning theory, a computation is considered feasible if it can be done in polynomial time. There are two kinds of time complexity results. Positive results show that a certain class of functions can be learned in polynomial time. Negative results show that certain classes cannot be learned in polynomial time. The types of machine learning algorithms differ in their approach, the type of data they input and output, and the type of task or problem that they are intended to solve. Supervised learning algorithms build a mathematical model of a set of data that contains both the inputs and the desired outputs. The data is known as training data, and consists of a set of training examples. Each training example has one or more inputs and a desired output, also known as a supervisory signal. In the case of semi-supervised learning algorithms, some of the training examples are missing the desired output. In the mathematical model, each training example is represented by an array or vector, and the training data by a matrix. Through iterative optimization of an objective function, supervised learning algorithms learn a function that can be used to predict the output associated with new inputs. An optimal function will allow the algorithm to correctly determine the output for inputs that were not a part of the training data. An algorithm that improves the accuracy of its outputs or predictions over time is said to have learned to perform that task. Supervised learning algorithms include classification and regression. Classification algorithms are used when the outputs are restricted to a limited set of values, and regression algorithms are used when the outputs may have any numerical value within a range. Similarity learning is an area of supervised machine learning closely related to regression and classification, but the goal is to learn from examples using a similarity function that measures how similar or related two objects are. It has applications in ranking, recommendation systems, visual identity tracking, face verification, and speaker verification. Unsupervised learning algorithms take a set of data that contains only inputs, and find structure in the data, like grouping or clustering of data points. The algorithms therefore learn from test data that has not been labeled, classified or categorized. Instead of responding to feedback, unsupervised learning algorithms identify commonalities in the data and react based on the presence or absence of such commonalities in each new piece of data. A central application of unsupervised learning is in the field of density estimation in statistics, though unsupervised learning encompasses other domains involving summarizing and explaining data features. Cluster analysis is the assignment of a set of observations into subsets (called clusters) so that observations within the same cluster are similar according to one or more predesignated criteria, while observations drawn from different clusters are dissimilar. Different clustering techniques make different assumptions on the structure of the data, often defined by some similarity metric and evaluated, for example, by internal compactness, or the similarity between members of the same cluster, and separation, the difference between clusters. Other methods are based on estimated density and graph connectivity. Reinforcement learning is an area of machine learning concerned with how software agents ought to take actions in an environment so as to maximize some notion of cumulative reward. Due to its generality, the field is studied in many other disciplines, such as game theory, control theory, operations research, information theory, simulation-based optimization, multi-agent systems, swarm intelligence, statistics and genetic algorithms. In machine learning, the environment is typically represented as a Markov Decision Process (MDP). Many reinforcement learning algorithms use dynamic programming techniques. Reinforcement learning algorithms do not assume knowledge of an exact mathematical model of the MDP, and are used when exact models are infeasible. Reinforcement learning algorithms are used in autonomous vehicles or in learning to play a game against a human opponent. Various processes, techniques and methods can be applied to one or more types of machine learning algorithms to enhance their performance. Several learning algorithms aim at discovering better representations of the inputs provided during training. Classic examples include principal components analysis and cluster analysis. Feature learning algorithms, also called representation learning algorithms, often attempt to preserve the information in their input but also transform it in a way that makes it useful, often as a pre-processing step before performing classification or predictions. This technique allows reconstruction of the inputs coming from the unknown data-generating distribution, while not being necessarily faithful to configurations that are implausible under that distribution. This replaces manual feature engineering, and allows a machine to both learn the features and use them to perform a specific task. Feature learning can be either supervised or unsupervised. In supervised feature learning, features are learned using labeled input data. Examples include artificial neural networks, multilayer perceptrons, and supervised dictionary learning. In unsupervised feature learning, features are learned with unlabeled input data. Examples include dictionary learning, independent component analysis, autoencoders, matrix factorization and various forms of clustering. Manifold learning algorithms attempt to do so under the constraint that the learned representation is low-dimensional. Sparse coding algorithms attempt to do so under the constraint that the learned representation is sparse, meaning that the mathematical model has many zeros. Multilinear subspace learning algorithms aim to learn low-dimensional representations directly from tensor representations for multidimensional data, without reshaping them into higher-dimensional vectors. Deep learning algorithms discover multiple levels of representation, or a hierarchy of features, with higher-level, more abstract features defined in terms of (or generating) lower-level features. It has been argued that an intelligent machine is one that learns a representation that disentangles the underlying factors of variation that explain the observed data. Feature learning is motivated by the fact that machine learning tasks such as classification often require input that is mathematically and computationally convenient to process. However, real-world data such as images, video, and sensory data has not yielded to attempts to algorithmically define specific features. An alternative is to discover such features or representations through examination, without relying on explicit algorithms. Sparse dictionary learning is a feature learning method where a training example is represented as a linear combination of basis functions, and is assumed to be a sparse matrix. The method is strongly NP-hard and difficult to solve approximately. A popular heuristic method for sparse dictionary learning is the K-SVD algorithm. Sparse dictionary learning has been applied in several contexts. In classification, the problem is to determine to which classes a previously unseen training example belongs. For a dictionary where each class has already been built, a new training example is associated with the class that is best sparsely represented by the corresponding dictionary. Sparse dictionary learning has also been applied in image de-noising. The key idea is that a clean image patch can be sparsely represented by an image dictionary, but the noise cannot. In data mining, anomaly detection, also known as outlier detection, is the identification of rare items, events or observations which raise suspicions by differing significantly from the majority of the data. Typically, the anomalous items represent an issue such as bank fraud, a structural defect, medical problems or errors in a text. Anomalies are referred to as outliers, novelties, noise, deviations and exceptions. In particular, in the context of abuse and network intrusion detection, the interesting objects are often not rare objects, but unexpected bursts in activity. This pattern does not adhere to the common statistical definition of an outlier as a rare object, and many outlier detection methods (in particular, unsupervised algorithms) will fail on such data, unless it has been aggregated appropriately. Instead, a cluster analysis algorithm may be able to detect the micro-clusters formed by these patterns. Three broad categories of anomaly detection techniques exist. Unsupervised anomaly detection techniques detect anomalies in an unlabeled test data set under the assumption that the majority of the instances in the data set are normal, by looking for instances that seem to fit least to the remainder of the data set. Supervised anomaly detection techniques require a data set that has been labeled as "normal" and "abnormal" and involves training a classifier (the key difference to many other statistical classification problems is the inherent unbalanced nature of outlier detection). Semi-supervised anomaly detection techniques construct a model representing normal behavior from a given normal training data set, and then test the likelihood of a test instance to be generated by the model. Decision tree learning uses a decision tree as a predictive model to go from observations about an item (represented in the branches) to conclusions about the item's target value (represented in the leaves). It is one of the predictive modeling approaches used in statistics, data mining and machine learning. Tree models where the target variable can take a discrete set of values are called classification trees; in these tree structures, leaves represent class labels and branches represent conjunctions of features that lead to those class labels. Decision trees where the target variable can take continuous values (typically real numbers) are called regression trees. In decision analysis, a decision tree can be used to visually and explicitly represent decisions and decision making. In data mining, a decision tree describes data, but the resulting classification tree can be an input for decision making. Association rule learning is a rule-based machine learning method for discovering relationships between variables in large databases. It is intended to identify strong rules discovered in databases using some measure of "interestingness". This rule-based approach generates new rules as it analyzes more data. The ultimate goal, assuming the set of data is large enough, is to help a machine mimic the human brain’s feature extraction and abstract association capabilities for data that has not been categorized. Rule-based machine learning is a general term for any machine learning method that identifies, learns, or evolves "rules" to store, manipulate or apply knowledge. The defining characteristic of a rule-based machine learning algorithm is the identification and utilization of a set of relational rules that collectively represent the knowledge captured by the system. This is in contrast to other machine learning algorithms that commonly identify a singular model that can be universally applied to any instance in order to make a prediction. Rule-based machine learning approaches include learning classifier systems, association rule learning, and artificial immune systems. found in the sales data of a supermarket would indicate that if a customer buys onions and potatoes together, they are likely to also buy hamburger meat. Such information can be used as the basis for decisions about marketing activities such as promotional pricing or product placements. In addition to market basket analysis, association rules are employed today in application areas including Web usage mining, intrusion detection, continuous production, and bioinformatics. In contrast with sequence mining, association rule learning typically does not consider the order of items either within a transaction or across transactions. Learning classifier systems (LCS) are a family of rule-based machine learning algorithms that combine a discovery component, typically a genetic algorithm, with a learning component, performing either supervised learning, reinforcement learning, or unsupervised learning. They seek to identify a set of context-dependent rules that collectively store and apply knowledge in a piecewise manner in order to make predictions. Inductive logic programming (ILP) is an approach to rule-learning using logic programming as a uniform representation for input examples, background knowledge, and hypotheses. Given an encoding of the known background knowledge and a set of examples represented as a logical database of facts, an ILP system will derive a hypothesized logic program that entails all positive and no negative examples. Inductive programming is a related field that considers any kind of programming languages for representing hypotheses (and not only logic programming), such as functional programs. Inductive logic programming is particularly useful in bioinformatics and natural language processing. Gordon Plotkin and Ehud Shapiro laid the initial theoretical foundation for inductive machine learning in a logical setting. Shapiro built their first implementation (Model Inference System) in 1981: a Prolog program that inductively inferred logic programs from positive and negative examples. The term inductive here refers to philosophical induction, suggesting a theory to explain observed facts, rather than mathematical induction, proving a property for all members of a well-ordered set. 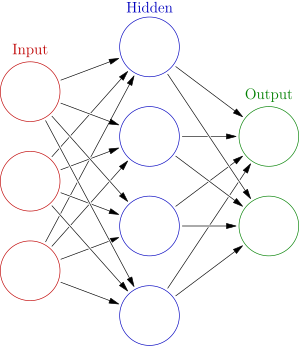 An artificial neural network is an interconnected group of nodes, akin to the vast network of neurons in a brain. Here, each circular node represents an artificial neuron and an arrow represents a connection from the output of one artificial neuron to the input of another. Artificial neural networks (ANNs), or connectionist systems, are computing systems vaguely inspired by the biological neural networks that constitute animal brains. The neural network itself is not an algorithm, but rather a framework for many different machine learning algorithms to work together and process complex data inputs. Such systems "learn" to perform tasks by considering examples, generally without being programmed with any task-specific rules. An ANN is a model based on a collection of connected units or nodes called "artificial neurons", which loosely model the neurons in a biological brain. Each connection, like the synapses in a biological brain, can transmit information, a "signal", from one artificial neuron to another. An artificial neuron that receives a signal can process it and then signal additional artificial neurons connected to it. In common ANN implementations, the signal at a connection between artificial neurons is a real number, and the output of each artificial neuron is computed by some non-linear function of the sum of its inputs. The connections between artificial neurons are called "edges". Artificial neurons and edges typically have a weight that adjusts as learning proceeds. The weight increases or decreases the strength of the signal at a connection. Artificial neurons may have a threshold such that the signal is only sent if the aggregate signal crosses that threshold. Typically, artificial neurons are aggregated into layers. Different layers may perform different kinds of transformations on their inputs. Signals travel from the first layer (the input layer), to the last layer (the output layer), possibly after traversing the layers multiple times. Deep learning consists of multiple hidden layers in an artificial neural network. This approach tries to model the way the human brain processes light and sound into vision and hearing. Some successful applications of deep learning are computer vision and speech recognition. Support vector machines (SVMs), also known as support vector networks, are a set of related supervised learning methods used for classification and regression. Given a set of training examples, each marked as belonging to one of two categories, an SVM training algorithm builds a model that predicts whether a new example falls into one category or the other. An SVM training algorithm is a non-probabilistic, binary, linear classifier, although methods such as Platt scaling exist to use SVM in a probabilistic classification setting. In addition to performing linear classification, SVMs can efficiently perform a non-linear classification using what is called the kernel trick, implicitly mapping their inputs into high-dimensional feature spaces. A Bayesian network, belief network or directed acyclic graphical model is a probabilistic graphical model that represents a set of random variables and their conditional independence with a directed acyclic graph (DAG). For example, a Bayesian network could represent the probabilistic relationships between diseases and symptoms. Given symptoms, the network can be used to compute the probabilities of the presence of various diseases. Efficient algorithms exist that perform inference and learning. Bayesian networks that model sequences of variables, like speech signals or protein sequences, are called dynamic Bayesian networks. Generalizations of Bayesian networks that can represent and solve decision problems under uncertainty are called influence diagrams. A genetic algorithm (GA) is a search algorithm and heuristic technique that mimics the process of natural selection, using methods such as mutation and crossover to generate new genotypes in the hope of finding good solutions to a given problem. In machine learning, genetic algorithms were used in the 1980s and 1990s. Conversely, machine learning techniques have been used to improve the performance of genetic and evolutionary algorithms. In 2006, the online movie company Netflix held the first "Netflix Prize" competition to find a program to better predict user preferences and improve the accuracy on its existing Cinematch movie recommendation algorithm by at least 10%. A joint team made up of researchers from AT&T Labs-Research in collaboration with the teams Big Chaos and Pragmatic Theory built an ensemble model to win the Grand Prize in 2009 for $1 million. Shortly after the prize was awarded, Netflix realized that viewers' ratings were not the best indicators of their viewing patterns ("everything is a recommendation") and they changed their recommendation engine accordingly. In 2010 The Wall Street Journal wrote about the firm Rebellion Research and their use of machine learning to predict the financial crisis. In 2012, co-founder of Sun Microsystems, Vinod Khosla, predicted that 80% of medical doctors jobs would be lost in the next two decades to automated machine learning medical diagnostic software. In 2014, it was reported that a machine learning algorithm had been applied in the field of art history to study fine art paintings, and that it may have revealed previously unrecognized influences between artists. Although machine learning has been transformative in some fields, machine-learning programs often fail to deliver expected results. Reasons for this are numerous: lack of (suitable) data, lack of access to the data, data bias, privacy problems, badly chosen tasks and algorithms, wrong tools and people, lack of resources, and evaluation problems. In 2018, a self-driving car from Uber failed to detect a pedestrian, who was killed after a collision. Attempts to use machine learning in healthcare with the IBM Watson system failed to deliver even after years of time and billions of investment. Classification machine learning models can be validated by accuracy estimation techniques like the Holdout method, which splits the data in a training and test set (conventionally 2/3 training set and 1/3 test set designation) and evaluates the performance of the training model on the test set. In comparison, the K-fold-cross-validation method randomly partitions the data into K subsets and then K experiments are performed each respectively considering 1 subset for evaluation and the remaining K-1 subsets for training the model. In addition to the holdout and cross-validation methods, bootstrap, which samples n instances with replacement from the dataset, can be used to assess model accuracy. ^ The definition "without being explicitly programmed" is often attributed to Arthur Samuel, who coined the term "machine learning" in 1959, but the phrase is not found verbatim in this publication, and may be a paraphrase that appeared later. Confer "Paraphrasing Arthur Samuel (1959), the question is: How can computers learn to solve problems without being explicitly programmed?" in Koza, John R.; Bennett, Forrest H.; Andre, David; Keane, Martin A. (1996). Automated Design of Both the Topology and Sizing of Analog Electrical Circuits Using Genetic Programming. Artificial Intelligence in Design '96. Springer, Dordrecht. pp. 151–170. doi:10.1007/978-94-009-0279-4_9. ^ Samuel, Arthur (1959). "Some Studies in Machine Learning Using the Game of Checkers". IBM Journal of Research and Development. 3 (3): 210–229. CiteSeerX 10.1.1.368.2254. doi:10.1147/rd.33.0210. ^ a b Mitchell, T. (1997). Machine Learning. McGraw Hill. p. 2. ISBN 978-0-07-042807-2. ^ R. Kohavi and F. Provost, "Glossary of terms," Machine Learning, vol. 30, no. 2–3, pp. 271–274, 1998. ^ Sarle, Warren (1994). "Neural Networks and statistical models". CiteSeerX 10.1.1.27.699. ^ a b c d Russell, Stuart; Norvig, Peter (2003) . Artificial Intelligence: A Modern Approach (2nd ed.). Prentice Hall. ISBN 978-0137903955. ^ a b Langley, Pat (2011). "The changing science of machine learning". Machine Learning. 82 (3): 275–279. doi:10.1007/s10994-011-5242-y. ^ Le Roux, Nicolas; Bengio, Yoshua; Fitzgibbon, Andrew (2012). "Improving First and Second-Order Methods by Modeling Uncertainty". In Sra, Suvrit; Nowozin, Sebastian; Wright, Stephen J. (eds.). Optimization for Machine Learning. MIT Press. p. 404. ^ a b Michael I. Jordan (2014-09-10). "statistics and machine learning". reddit. Retrieved 2014-10-01. ^ Cornell University Library. "Breiman: Statistical Modeling: The Two Cultures (with comments and a rejoinder by the author)". Retrieved 8 August 2015. ^ Mohri, Mehryar; Rostamizadeh, Afshin; Talwalkar, Ameet (2012). Foundations of Machine Learning. USA, Massachusetts: MIT Press. ISBN 9780262018258. ^ Alpaydin, Ethem (2010). Introduction to Machine Learning. London: The MIT Press. ISBN 978-0-262-01243-0. Retrieved 4 February 2017. ^ Russell, Stuart J.; Norvig, Peter (2010). Artificial Intelligence: A Modern Approach (Third ed.). Prentice Hall. ISBN 9780136042594. ^ Mohri, Mehryar; Rostamizadeh, Afshin; Talwalkar, Ameet (2012). Foundations of Machine Learning. The MIT Press. ISBN 9780262018258. ^ Alpaydin, Ethem (2010). Introduction to Machine Learning. MIT Press. p. 9. ISBN 978-0-262-01243-0. ^ Jordan, Michael I.; Bishop, Christopher M. (2004). "Neural Networks". In Allen B. Tucker (ed.). Computer Science Handbook, Second Edition (Section VII: Intelligent Systems). Boca Raton, Florida: Chapman & Hall/CRC Press LLC. ISBN 978-1-58488-360-9. ^ van Otterlo, M.; Wiering, M. (2012). Reinforcement learning and markov decision processes. Reinforcement Learning. Adaptation, Learning, and Optimization. 12. pp. 3–42. doi:10.1007/978-3-642-27645-3_1. ISBN 978-3-642-27644-6. ^ Y. Bengio; A. Courville; P. Vincent (2013). "Representation Learning: A Review and New Perspectives". IEEE Trans. PAMI, Special Issue Learning Deep Architectures. 35 (8): 1798–1828. arXiv:1206.5538. doi:10.1109/tpami.2013.50. PMID 23787338. ^ Nathan Srebro; Jason D. M. Rennie; Tommi S. Jaakkola (2004). Maximum-Margin Matrix Factorization. NIPS. ^ Coates, Adam; Lee, Honglak; Ng, Andrew Y. (2011). An analysis of single-layer networks in unsupervised feature learning (PDF). Int'l Conf. on AI and Statistics (AISTATS). ^ Csurka, Gabriella; Dance, Christopher C.; Fan, Lixin; Willamowski, Jutta; Bray, Cédric (2004). Visual categorization with bags of keypoints (PDF). ECCV Workshop on Statistical Learning in Computer Vision. ^ Daniel Jurafsky; James H. Martin (2009). Speech and Language Processing. Pearson Education International. pp. 145–146. ^ Tillmann, A. M. (2015). "On the Computational Intractability of Exact and Approximate Dictionary Learning". IEEE Signal Processing Letters. 22 (1): 45–49. arXiv:1405.6664. Bibcode:2015ISPL...22...45T. doi:10.1109/LSP.2014.2345761. ^ Hodge, V. J.; Austin, J. (2004). "A Survey of Outlier Detection Methodologies" (PDF). Artificial Intelligence Review. 22 (2): 85–126. CiteSeerX 10.1.1.318.4023. doi:10.1007/s10462-004-4304-y. ^ Dokas, Paul; Ertoz, Levent; Kumar, Vipin; Lazarevic, Aleksandar; Srivastava, Jaideep; Tan, Pang-Ning (2002). "Data mining for network intrusion detection" (PDF). Proceedings NSF Workshop on Next Generation Data Mining. ^ Chandola, V.; Banerjee, A.; Kumar, V. (2009). "Anomaly detection: A survey". ACM Computing Surveys. 41 (3): 1–58. doi:10.1145/1541880.1541882. ^ Piatetsky-Shapiro, Gregory (1991), Discovery, analysis, and presentation of strong rules, in Piatetsky-Shapiro, Gregory; and Frawley, William J.; eds., Knowledge Discovery in Databases, AAAI/MIT Press, Cambridge, MA. ^ "How Does Association Learning Work?". deepai.org. ^ Bassel, George W.; Glaab, Enrico; Marquez, Julietta; Holdsworth, Michael J.; Bacardit, Jaume (2011-09-01). "Functional Network Construction in Arabidopsis Using Rule-Based Machine Learning on Large-Scale Data Sets". The Plant Cell. 23 (9): 3101–3116. doi:10.1105/tpc.111.088153. ISSN 1532-298X. PMC 3203449. PMID 21896882. ^ Agrawal, R.; Imieliński, T.; Swami, A. (1993). "Mining association rules between sets of items in large databases". Proceedings of the 1993 ACM SIGMOD international conference on Management of data - SIGMOD '93. p. 207. CiteSeerX 10.1.1.40.6984. doi:10.1145/170035.170072. ISBN 978-0897915922. ^ Urbanowicz, Ryan J.; Moore, Jason H. (2009-09-22). "Learning Classifier Systems: A Complete Introduction, Review, and Roadmap". Journal of Artificial Evolution and Applications. 2009: 1–25. doi:10.1155/2009/736398. ISSN 1687-6229. ^ Plotkin G.D. Automatic Methods of Inductive Inference, PhD thesis, University of Edinburgh, 1970. ^ Shapiro, Ehud Y. Inductive inference of theories from facts, Research Report 192, Yale University, Department of Computer Science, 1981. Reprinted in J.-L. Lassez, G. Plotkin (Eds. ), Computational Logic, The MIT Press, Cambridge, MA, 1991, pp. 199–254. ^ Shapiro, Ehud Y. "The model inference system." Proceedings of the 7th international joint conference on Artificial intelligence-Volume 2. Morgan Kaufmann Publishers Inc., 1981. ^ Honglak Lee, Roger Grosse, Rajesh Ranganath, Andrew Y. Ng. "Convolutional Deep Belief Networks for Scalable Unsupervised Learning of Hierarchical Representations" Proceedings of the 26th Annual International Conference on Machine Learning, 2009. ^ Cortes, Corinna; Vapnik, Vladimir N. (1995). "Support-vector networks". Machine Learning. 20 (3): 273–297. doi:10.1007/BF00994018. ^ Goldberg, David E.; Holland, John H. (1988). "Genetic algorithms and machine learning". Machine Learning. 3 (2): 95–99. doi:10.1007/bf00113892. ^ Michie, D.; Spiegelhalter, D. J.; Taylor, C. C. (1994). "Machine Learning, Neural and Statistical Classification". Ellis Horwood Series in Artificial Intelligence. Bibcode:1994mlns.book.....M.
^ Zhang, Jun; Zhan, Zhi-hui; Lin, Ying; Chen, Ni; Gong, Yue-jiao; Zhong, Jing-hui; Chung, Henry S.H. ; Li, Yun; Shi, Yu-hui (2011). "Evolutionary Computation Meets Machine Learning: A Survey" (PDF). Computational Intelligence Magazine. 6 (4): 68–75. doi:10.1109/mci.2011.942584. ^ "The Netflix Tech Blog: Netflix Recommendations: Beyond the 5 stars (Part 1)". 2012-04-06. Retrieved 8 August 2015. ^ Scott Patterson (13 July 2010). "Letting the Machines Decide". The Wall Street Journal. Retrieved 24 June 2018. ^ Vinod Khosla (January 10, 2012). "Do We Need Doctors or Algorithms?". Tech Crunch. ^ "Why Machine Learning Models Often Fail to Learn: QuickTake Q&A". Bloomberg.com. 2016-11-10. Retrieved 2017-04-10. ^ "The First Wave of Corporate AI Is Doomed to Fail". Harvard Business Review. 2017-04-18. Retrieved 2018-08-20. ^ "Why the A.I. euphoria is doomed to fail". VentureBeat. 2016-09-18. Retrieved 2018-08-20. ^ "9 Reasons why your machine learning project will fail". www.kdnuggets.com. Retrieved 2018-08-20. ^ "Why Uber's self-driving car killed a pedestrian". The Economist. Retrieved 2018-08-20. ^ "IBM's Watson recommended 'unsafe and incorrect' cancer treatments - STAT". STAT. 2018-07-25. Retrieved 2018-08-21. ^ Hernandez, Daniela; Greenwald, Ted (2018-08-11). "IBM Has a Watson Dilemma". Wall Street Journal. ISSN 0099-9660. Retrieved 2018-08-21. ^ Garcia, Megan (2016). "Racist in the Machine". World Policy Journal. 33 (4): 111–117. doi:10.1215/07402775-3813015. ISSN 0740-2775. ^ Caliskan, Aylin; Bryson, Joanna J.; Narayanan, Arvind (2017-04-14). "Semantics derived automatically from language corpora contain human-like biases". Science. 356 (6334): 183–186. arXiv:1608.07187. Bibcode:2017Sci...356..183C. doi:10.1126/science.aal4230. ISSN 0036-8075. PMID 28408601. ^ "Opinion | When an Algorithm Helps Send You to Prison". New York Times. Retrieved 2018-08-20. ^ "Google apologises for racist blunder". BBC News. 2015-07-01. Retrieved 2018-08-20. ^ "Google 'fixed' its racist algorithm by removing gorillas from its image-labeling tech". The Verge. Retrieved 2018-08-20. ^ "Opinion | Artificial Intelligence's White Guy Problem". New York Times. Retrieved 2018-08-20. ^ Metz, Rachel. "Why Microsoft's teen chatbot, Tay, said lots of awful things online". MIT Technology Review. Retrieved 2018-08-20. ^ Simonite, Tom. "Microsoft says its racist chatbot illustrates how AI isn't adaptable enough to help most businesses". MIT Technology Review. Retrieved 2018-08-20. ^ Hempel, Jessi (2018-11-13). "Fei-Fei Li's Quest to Make Machines Better for Humanity". Wired. ISSN 1059-1028. Retrieved 2019-02-17. ^ Kohavi, Ron (1995). "A Study of Cross-Validation and Bootstrap for Accuracy Estimation and Model Selection" (PDF). International Joint Conference on Artificial Intelligence. ^ Pontius, Robert Gilmore; Si, Kangping (2014). "The total operating characteristic to measure diagnostic ability for multiple thresholds". International Journal of Geographical Information Science. 28 (3): 570–583. doi:10.1080/13658816.2013.862623. ^ Bostrom, Nick (2011). "The Ethics of Artificial Intelligence" (PDF). Retrieved 11 April 2016. ^ Edionwe, Tolulope. "The fight against racist algorithms". The Outline. Retrieved 17 November 2017. ^ Jeffries, Adrianne. "Machine learning is racist because the internet is racist". The Outline. Retrieved 17 November 2017. ^ Narayanan, Arvind (August 24, 2016). "Language necessarily contains human biases, and so will machines trained on language corpora". Freedom to Tinker. ^ Char, D. S.; Shah, N. H.; Magnus, D. (2018). "Implementing Machine Learning in Health Care—Addressing Ethical Challenges". New England Journal of Medicine. 378 (11): 981–983. doi:10.1056/nejmp1714229. PMC 5962261. PMID 29539284. Stuart Russell & Peter Norvig, (2009). Artificial Intelligence – A Modern Approach. Pearson, ISBN 9789332543515.